Fury, the newest war movie to hit the theaters, is an excellent film in many ways reminiscent of Spielberg’s classic Saving Private Ryan. There are many points of contact between the movie, and some major points of departure as well. The time frame for Fury is a few months before VE Day. The U.S. forces have pushed into Germany and Germany has resorted to extreme methods like drafting women and children into the battle. This affects the plot, but does not drive the plot like D-Day does SPR. The plot of SPR has to do with saving the last remaining son of a widow in the aftermath of D-Day. Here we see a few instances of the cruelty and desperation of the SS, and the response of the main characters to the SS. In one scene, an SS officer is not allowed to surrender with the rest of the German “troops” (including teenaged girls). Both movies focus on one unit. In SPR is is a Ranger unit sent to find Private Ryan. Here it is a tank crew. They don’t receive their mission until at least the mid-point of the movie. Both units have a highly competent yet mysterious leader: Capt. Miller and Sgt. “Wardaddy” Collier (Brad Pitt in his best movie in years). Yes, every crew member has a nickname. In SPR they keep guessing what his vocation in pre-war life was. Here there is no such game but they all wonder why he knows German. Late in the movie the mystery deepens when they discover his familiarity with Scripture. While both leaders are highly effective, they are also secretly damaged. Miller’s hand would increasingly shake during downtime. 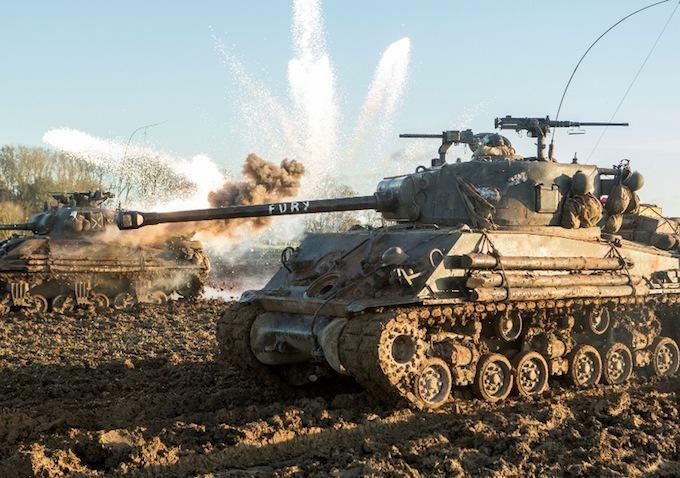 In a rare moment of self-disclosure he admits “every time I kill someone I feel farther from home.” In the opening sequence, Fury is the only tank to have survived a battle in which they lost the assistant driver. Back in the camp, Collier finds an isolated spot for a “moment”. He hates the war and what it does to him but there is no escape. Enter the newbie. In both cases it is a man who was not prepared for combat. In SPR he is Corporal Upham, a translator since they will be going behind the current lines to retrieve Ryan who was a paratrooper. Here it is a typist named Norman. He is not prepared for life in a tank or for combat. Much of the movie is about his struggle with the realities of war with which the other crew members are all too familiar. In his first two encounters there is failure that costs the lives of others. His sense of right and wrong have him ill-equipped for combat. But, as “Bible” Swan guesses, Norman is a “Mainliner” or liberal, nominal Christian. In both movies the action scenes strive for authenticity. This means they are intense and graphic. They accurately convey the horror of war, and deepen your appreciation for the men who endured these circumstances. I don’t think I’ve read anything by J.V. Fesko before. I thought I’d start with a book carrying a lighter price tag before I started investing lots of money. As a result, The Rule of Love: Broken, Fulfilled and Applied has been sitting in my ‘to read” pile for some time. After reading a number of larger volumes I thought I’d go with a shorter book like this. For those not familiar with Fesko, he is an OPC pastor and associate professor of Systematic Theology at Westminster Seminary California. It is common for people who deny the on-going authority of the moral law to use terms like the rule of love to describe how God reveals His moral will to us. Fesko is not one of those people. This book is an exposition, however brief, on the Ten Commandments. He does treat them within their historical, covenantal and redemptive contexts. Too often people look at them in abstraction. We must remember they were given to the people of Israel, but YHWH who is the God of Abraham, Isaac and Jacob after He delivered them from Egypt and slavery. We must understand this original historical and covenantal context to properly understand them. But as Christians we also view them through Christ’s redemptive work in which He fulfilled them for us, and by virtue of our union with Him works in us so we keep them in increasing measure. As a result, the Ten Commandments are not some religious artifact from some bygone era. Neither is our obedience to them the ground of our justification. Christ’s obedience is the ground of our justification. We also remember that while they provide the direction of our sanctification (the 3rd use of the law) they do not provide the power for it. That comes from the Spirit by virtue of our union with Christ (which he mentions quite often). It would be easy to see the book are formulaic because he works through these three categories for each of the ten. But you should see this as good pedagogue. Being obvious is not a problem particularly when the lack of obviousness creates great misunderstanding. The chapters are not very long, and he provides some study questions to help you think through and apply the material. Fesko begins with the prologue which stresses the covenantal and historical context for the rest. The Law was given to them, not to save them, but to know how to live together with God and one another. They were never to forget that He rescued them from slavery. As we read them we remember the greater redemption to which this great redemption pointed to. As Christians we hear them as people who have been justified, not those seeking justification. It is precisely when we ignore this, including when we put them up on courthouse lawns or walls, that we begin to turn it into a ladder.